Jack Wolf, a 2018 graduate of Brecksville-Broadview Heights High School, recently gave back to the BBHCSD community through the donation of 400 Go Bags filled with first-aid supplies to every building in the District. The Go Bags were distributed to teachers prior to the start of the school year, and include band aids, safety gloves, a whistle, paper pad, Sharpie marker, hand sanitizer and first-aid kit. As a result, teachers will have an enhanced level of preparedness in the event of an emergency and will have them on-hand for future fire and evacuation drills. A member of Venturing Crew 652 out of St. 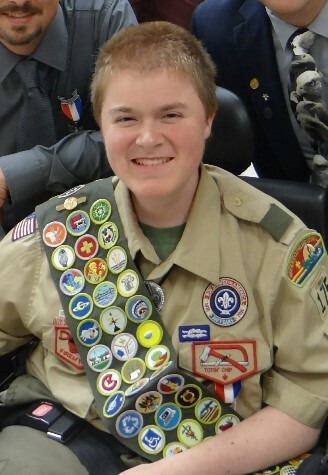 Basil the Great in Brecksville, Jack coordinated the creation and delivery of the Go Bags as part of his Summit Project, which is the Eagle Scout equivalent in the Boy Scouts of America Venturing Program. Jack obtained the donated supplies from local organizations and businesses, including MetroHealth System, Walgreens, University Hospitals in partnership with the Broadview Heights Fire Department, and Ward 2 Broadview Heights Councilman Brian Wolf, who is also Jack’s father. Currently starting his freshman year at the University of Akron, Jack plans on pursuing an Associate Degree in Marketing and a Bachelor’s Degree in Organizational Supervision. To show its deep appreciation to Jack and his family for promoting the safety and security of our students, the BBHCSD will recognized Jack at the next Board of Education Meeting on Monday, September 24, 2018. The Brecksville-Broadview Heights City Schools once again thank Jack for his generosity and wish him continued success in the future!